I'll admit it - I've failed. My 2015 book challenge has been an absolute write off (if you'll pardon the pun) but I'm going to continue it throughout 2016 too! 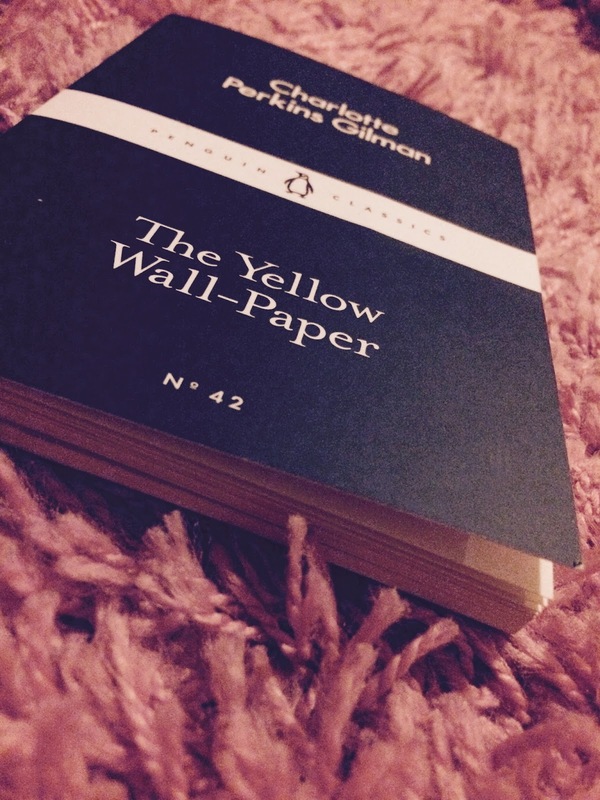 Today's instalment is a book with a colour in the title, and it comes in the form of The Yellow Wall-Paper which is a teeny tiny book that I've just read for uni. One of my modules is 'understanding madness through literature' and I love it; this is the first book we had to read for that module, and it was an interesting one. It features a woman suffering from schizophrenia, and her illness is projected onto/represented by the wallpaper in the room where she is living for the Summer. We see her relationship with her husband, who is a physician, and how unhelpful he is towards her illness - it's a reflection of the way mental illness has been and still is treated in an entirely different way to a physical illness or injury. He treats her like a child, confining her to a bed at the top of the house, in a room with bars on the windows and a hideous yellow wallpaper. He forbids her from writing, so she has no escape from living with the illness that tortures her day and night. When her illness isn't torturing her, it's the wallpaper - which is a clear manifestation of the illness; she focuses on the patterns, the women behind the bars, a reflection of herself although she can't see that. The story, although being short, packs a lot into it. We get to know the character (who remains unnamed until the end) so well as she tells us her story in tiny diary entries when her husband isn't looking. It's beautifully written and full of the frustration that so many people face, day to day, when suffering from a mental illness. i've always wanted to read this book and this post has prompted me to buy this! i can't wait to read it!! I read this book during my second year at uni and it's always stuck with me. I studied Literature but specialised in Victorian Lit and everything about this story highlights the lack of power and control women had, over their bodies, their minds, their relationships - it was such a patriarchal society and CPG illustrates it beautifully. I always recommend The Yellow Wallpaper, it's a quick and easy read but makes the reader ask so many questions. It would have been highly taboo for a female writer to publish this novel at that time and that's one of the other reasons I love it - pushing boundaries.